NASCAR star Bubba Wallace, who drives the legendary No. 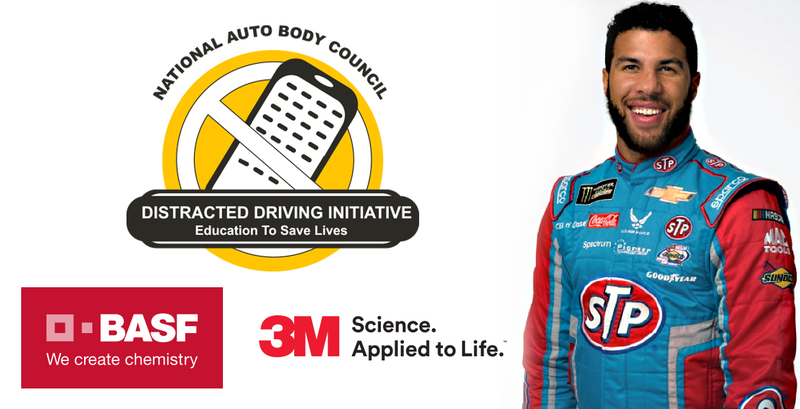 43 for Richard Petty Motorsports in the Monster Energy NASCAR Cup Series, is teaming up with the National Auto Body Council (NABC) again to put the brakes on distracted driving. • Be well rested before getting behind the wheel. If you are out late or too tired to drive home, sleep over or call Uber. • Pull over if you need to make a call, check a message, deal with passengers, eat or drink. • Install an app on their phone that block texts and phone calls when you are behind the wheel. • Almost 3-in-10 surf the net. And almost 3-in-10 video chat! 2 Source: Online survey with 61,325 respondents (total distracted drivers n=5,766) conducted by Added Value. Ongoing survey, data represented here were collected June 2012-July 2016. National panel sample (ages 15-54, drive, and have a smartphone). 3 Source: Cellphone survey with 1,003 respondents conducted by Braun Research. Survey fielded August 18-23, 2015 Nationally representative sample (ages 16-65, drive and use smartphone apps). The National Auto Body Council is the premier organization of collision industry partners dedicated to strategic networking opportunities that positively change lives in the communities we serve. The collaborative membership of the National Auto Body Council has gifted more than 2,000 vehicles, provided extrication opportunities to over 1,000 First Responders and contributed to thousands of distracted driving pledges in our communities through NABC Recycled Rides™, First Responder Emergency Extrication (F.R.E.E.™) and the Distracted Driving Initiative. That effort equates to a 4:1 ROI in dollar value delivered from NABC membership dollars. The National Auto Body Council is changing the paradigm of how the collision industry works and is viewed. For more information, visit www.NationalAutoBodyCouncil.org.